Pre-Cast Concrete Retaining Wall Stone capped with Tumbled Bluestone Coping. During the process of gathering front yard and backyard landscaping ideas for you new landscape, much of the information you’ll find seems to suggest choosing either pavers OR natural stone for all of your hardscaping. Because of this, it’s common to find Dutchess County, NY homeowners identify themselves as in either the bluestone/flagstone corner or the concrete pavers corner. But what if you didn’t have to choose just one? What if you could instead use both? 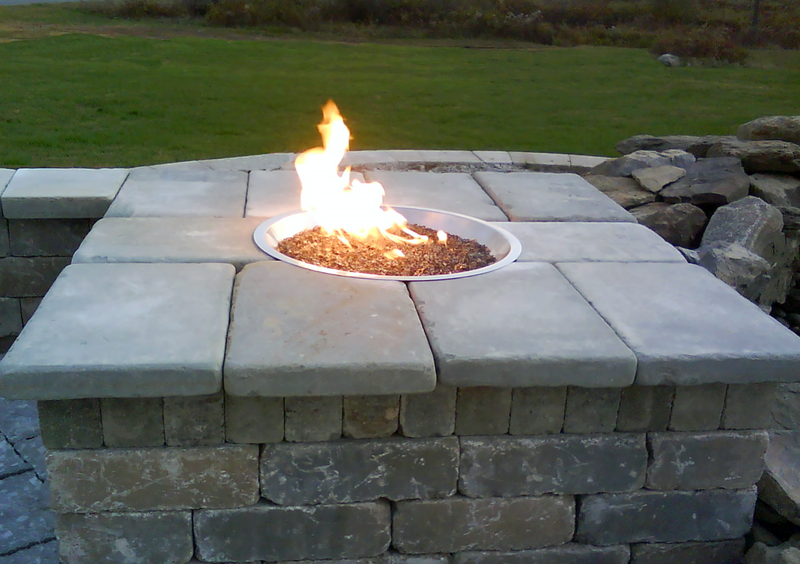 Professional landscape designers have for many years been combining hardscape materials successfully for residential patios, walkways, retaining walls, pool patios, outdoor fireplaces and fire pits. Right on the same property one might find a bluestone patio bordered with a Unilock product like the Courtstone paver. Along the outside of the patio could be a seat wall built using concrete retaining walls and capped with bluestone coping. Perhaps the landscape designer even chooses the color of the pavers and walls to compliment the tones found in the veneer stone on the house itself, along the foundation. These types of products are often found in Harmony Hill’s landscaping projects located in the Hopewell Junction, Pleasant Valley, Lagrangeville area. The Dutchess County region overall is perfect for this type of mixing and matching of stone products. Not only is it possible to combine different materials, it’s actually very effective both functionally and aesthetically. Natural stone and pavers have benefits and limitations, so this approach allows homeowners to get the best product for the project. For instance, bluestone and flagstone are both classic, timeless choices for patios and walkways but for pool decks, the natural stone gets a little too hot if in full sun. Because concrete paver tend to stay much cooler under foot, they are perfect for pool patios and poolscapes. Another helpful example is found in retaining wall construction. While natural stone products like fieldstone are awesome for smaller retaining walls and freestanding walls like those found in outdoor fireplaces and seat walls, using natural stone for large, truly functional retaining walls is not always a perfect match. Precast concrete retaining walls like those found in the Unilock and Tech-Bloc product lines on the other hand, can help these types of retaining walls be more structurally sound and affordable. So if you’re beginning to gather landscaping ideas for your project, be sure to add this one to the mix. Because of the naturalistic setting that many Hopewell Junction properties have, using both flagstone and concrete pavers can help to create a perfect style for both your front yard and backyard projects. Learn more about the differences here.